Poker’s a game that’s been played for hundreds of years, in one form or another. Today, of course, the majority of poker games take place online and even for absolute beginners it’s possible to start playing poker the moment you join a poker or casino site. When you play online at 32red casino, the standard welcome bonus that you get is an extra $32 of gaming credit for every $10 you put in. If you choose to start with the poker bonus, you can earn a welcome bonus of up to $1,000, earn 30% rakeback every time you play and get six entries to $500 freeroll tournaments – where you pay nothing to play. Although some aspects of the game have changed with its transition online – reading whether another player is bluffing, for example, is harder to do when you’re not sitting face to face and watching body language – some of the oldest poker phrases are still in use. Some of the expressions don’t make a lot of sense until you know the history behind them. 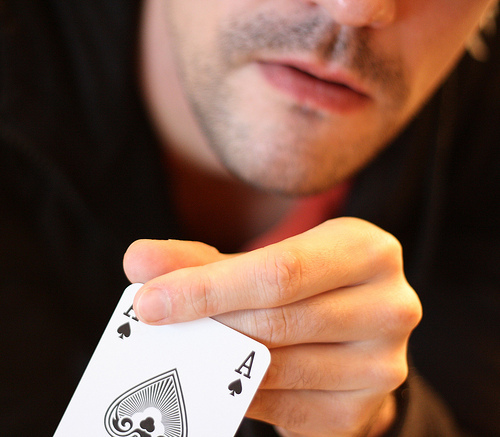 When anyone has a pair of black aces and two black eights in a hand, people will say it’s a ‘dead man’s hand’. The story behind this is the assassination of Wild Bill Hickok – a Wild West gunfighter and scout who used to play poker regularly at the Nuttal and Mann’s Saloon No.10 in Dakota Territory. Wild Bill would always choose a chair where he had his back to the wall and could see both entrances to the bar, thereby protecting himself from would-be assailants sneaking up behind him. However on 2 August 1876, his chosen seat was taken, so he had to sit where only one of the entrances was visible. His assassin, Jack McCall, was able to come into the saloon the other way and shot Wild Bill in the back of the head. As he fell to the ground, the hand he was holding was displayed to show two black Aces and two black eights. A more modern poker term is a chip and a chair. This is often said when you still have a chance of winning a poker game, no matter how slim. In the 1982 World Series of Poker Main Event, player Jack Strauss had lost a hand when he’d put all his chips into the pot. But as he pushed back his chair to leave the table, he noticed he had one chip left under his napkin. As he hadn’t yet declared to be all-in, he was able to continue playing and of course, went on to win the tournament! Someone who plays poker ‘on tilt’ leaves sense behind them. People who play on tilt will make riskier decisions than most and other players can often take advantage of this. Apparently the phrase was originally to do with playing pinball, where players would sometimes tilt the table to get the ball to roll in their favour. Nowadays, though, tilting the pinball table would be picked up by motion sensors which shut the machine down to stop this kind of cheating! New poker phrases are probably being used today that are connected with online playing – but for now, these are just a few of the mainstays in poker speak.